You can use machine learning to observe the static parts of the message, cluster similar messages together, and classify them into message categories. The categorization_field_name property indicates which field will be categorized. The resulting categories are used in a detector by setting by_field_name, over_field_name, or partition_field_name to the keyword mlcategory. If you do not specify this keyword in one of those properties, the API request fails. The optional categorization_examples_limit property specifies the maximum number of examples that are stored in memory and in the results data store for each category. The default value is 4. Note that this setting does not affect the categorization; it just affects the list of visible examples. If you increase this value, more examples are available, but you must have more storage available. If you set this value to 0, no examples are stored. The optional categorization_filters property can contain an array of regular expressions. If a categorization field value matches the regular expression, the portion of the field that is matched is not taken into consideration when defining categories. The categorization filters are applied in the order they are listed in the job configuration, which allows you to disregard multiple sections of the categorization field value. In this example, we have decided that we do not want the detailed SQL to be considered in the message categorization. This particular categorization filter removes the SQL statement from the categorization algorithm. To add the categorization_examples_limit property, you must use the Edit JSON tab and copy the analysis_limits object from the API example. Categorization uses English dictionary words to identify log message categories. By default, it also uses English tokenization rules. For this reason, if you use the default categorization analyzer, only English language log messages are supported, as described in the Machine Learning Limitations. The pattern_replace character filter here achieves exactly the same as the categorization_filters in the first example. The ml_classic tokenizer works like the non-customizable tokenization that was used for categorization in older versions of machine learning. If you want the same categorization behavior as older versions, use this property value. By default, English day or month words are filtered from log messages before categorization. If your logs are in a different language and contain dates, you might get better results by filtering the day or month words in your language. The optional categorization_analyzer property allows even greater customization of how categorization interprets the categorization field value. It can refer to a built-in Elasticsearch analyzer or a combination of zero or more character filters, a tokenizer, and zero or more token filters. Tokens basically consist of hyphens, digits, letters, underscores and dots. By default, categorization ignores tokens that begin with a digit. By default, categorization also ignores tokens that are hexadecimal numbers. Underscores, hyphens, and dots are removed from the beginning of tokens. Underscores, hyphens, and dots are also removed from the end of tokens. The key difference between the default categorization_analyzer and this example analyzer is that using the ml_classic tokenizer is several times faster. The difference in behavior is that this custom analyzer does not include accented letters in tokens whereas the ml_classic tokenizer does, although that could be fixed by using more complex regular expressions. For more information about the categorization_analyzer property, see Categorization Analyzer. To add the categorization_analyzer property in Kibana, you must use the Edit JSON tab and copy the categorization_analyzer object from one of the API examples above. 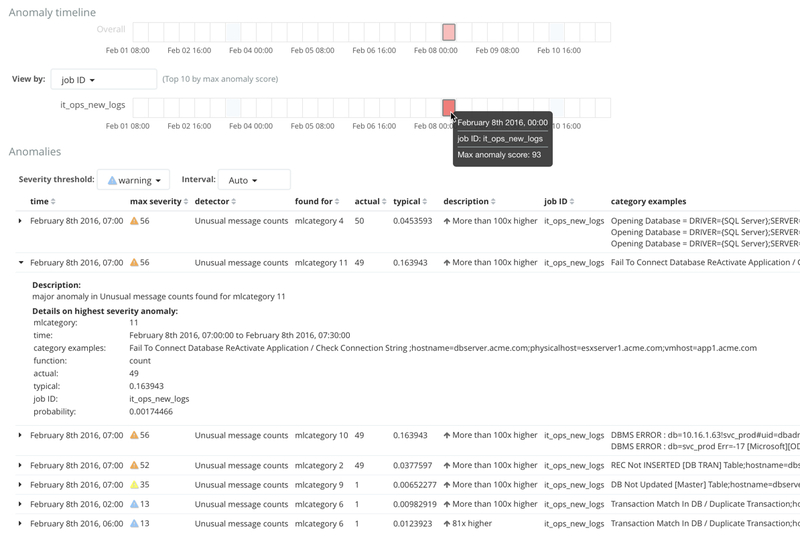 For this type of job, the Anomaly Explorer contains extra information for each anomaly: the name of the category (for example, mlcategory 11) and examples of the messages in that category. In this case, you can use these details to investigate occurrences of unusually high message counts for specific message categories.